The HP Designjet Z3200 is a 24" wide-format inkjet printer with an impressive 2400 x 1200dpi output, for professional photographers, digital fine artists, print service providers, graphic designers, and pre-press professionals. Utilizing 12 pigment-based inks (including a new Chromatic Red ink formulation) the Z3200 produces beautiful high-resolution, gallery-quality prints in B&W and color with smooth transitions and true neutral grays. HP boasts 200-year permanence on a wide range of HP and HP Hahnemuhle papers. 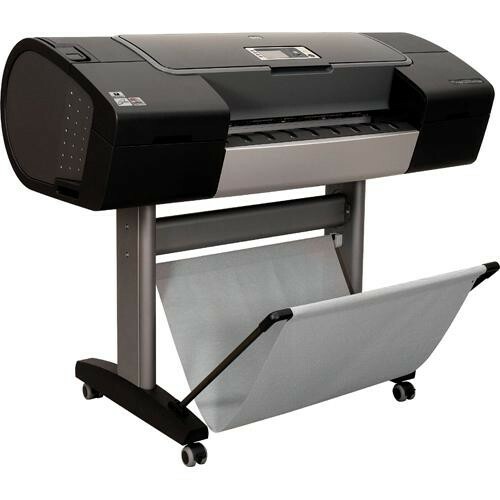 The printer features an embedded spectrophotometer to enable easy calibration and create paper profiles for consistent output and ink efficiency, taking the cost, effort, and guesswork out of printer color management. The Z3200 supports a wide variety of media to meet the demands of most professional users including matte fine art paper, satin or glossy photo paper, canvas, backlit film, banners, or any of a wide range of other compatible substrates. The HP Z3200 features a palette of 12 Vivera pigment inks including: Blue, Green, Magenta, a newly formulated Chromatic Red, Yellow, Gray, Photo Black, Matte Black, Light Cyan, Light Gray, and Light Magenta. These superior inks yield long-lasting gallery-quality prints in black and white and color. Additionally, a Gloss Enhancer adds superior gloss uniformity and minimizes bronzing on most glossy photo papers. Expect rich, dark blacks on matte and glossy papers. Six print heads, each assigned to 2 colors, contains 2112 nozzles (1056 per color). Three heads lay down 4-picoliter sized droplets in Light Cyan, Light Magenta, Light Gray, Photo Black, Enhancer, and Green. Another three lay down 6-picoliter sized droplets in Magenta, Yellow, Matte Black, Red, Green, and Blue. An Optical Drop Detector (ODD) prevents nozzle clogging. The Z3200 comes with 256MB standard memory and an 80GB Hard Disk Drive. The HDD effectively boots up as a computer on your network. This printer contains an HP Embedded Web Server and is compatible with Windows, Citrix MetaFrame, and Mac operating systems. Calibration and profiling are made simple with HP DreamColor Technologies and its embedded automatic spectrophotometer from X-Rite, which insures both color consistency and color accuracy. It takes the cost, effort, and guesswork out of printer color management. You are never more than a few mouse clicks from a professional ICC profile customized for your printer, paper, and environmental conditions. One of the advantages with this size printer is that you can use roll media up to 24" width. The roll paper holder is at the back, taking both 2" and 3" core size rolls. The paper is simply fed into the back loading slot. At the front, there is a robust print catcher that folds out to prevent prints hitting the floor. For sheet fed paper, the loading tray/guide folds down. The Designjet Z3200 includes support for more than 50 types of HP large-format printing materials, including HP's new Baryte Satin Art Paper, Fine Art Paper, HP Everyday Pigment Ink Photo Papers, HP Premium Matte Photo Paper and HP Premium Semi-gloss Proofing Paper. The Z3200 also delivers top-quality images on HP Hahnemuhle Art Papers, Banners and other media. The Z3200 comes with a powerful software package that includes Printer drivers and the HP Printer Utility which includes the HP Color Center. The enhanced HP Color Center offers a single point of control for all color-related functions. From there, you can download or easily create your own Paper Presets, and have the option of more control using advanced settings. Designjet Z3200 24" Large Format Inkjet Printer is rated 5.0 out of 5 by 1. Rated 5 out of 5 by JKing from This printer is simply encredible!!! I had as Epson 9500, and finally sold that and and thank goodness I did my homework on this printer. It is awesome when it comes to printing 24x30s and everything inbetween. Highly recommend this printer.